Cheesy Chicken Noodle Soup - ready in under 30 minutes! Just dump everything in the pot and let it simmer. SO easy! We LOVE this soup!!! Chicken, cheese soup, chicken broth, milk, celery, carrots, egg noodles and cheddar cheese. We make this at least once a month. 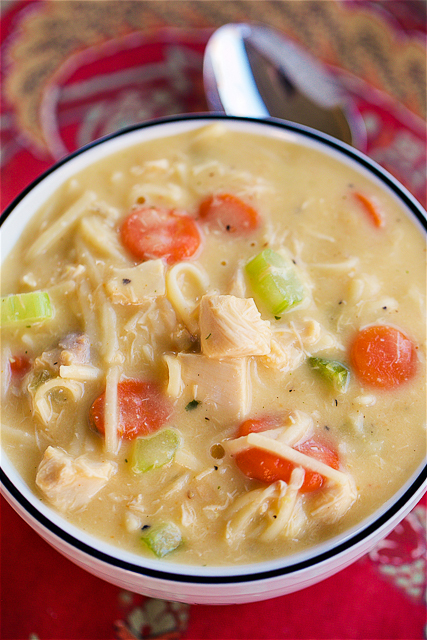 This Cheesy Chicken Noodle Soup is a favorite in our house. We make it about once a month during the winter time. It is super simple to make and tastes great! I used some chopped up rotisserie chicken in this soup. Rotisserie chicken is a HUGE timesaver! 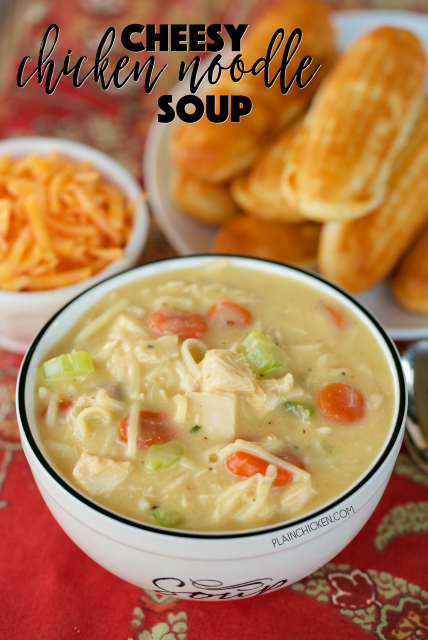 We always have some in our freezer for quick meals like this Cheesy Chicken Noodle Soup. This soup only takes about 30 minutes from start to finish. It is mostly a hands-off preparation. Just dump everything in the pot and let it cook. I have not made this in the slow cooker, but I'm sure it would be fine if you wanted to prepare the soup that way. Just add the noodles and cheese about 15 minutes before you serve the soup. In a large stockpot/Dutch oven, combine cooked chicken, cheese soup, chicken broth, milk, chopped celery, sliced carrots, onion powder, garlic powder, salt and pepper. This sounds so yummy! Definitely on my "to-do" list for comfort foods! Thanks Steph! I have a very good chicken soup recipe but never thought of putting cheese it it, will have to give it a try. Yum, what are the breadsticks you served with it? Hey Steph, can't wait to make this. So what are dried fine egg noodles and where did you find them?? I looked in Safeway and Target and didn't see anything!! Hi to Jack, Fluffy and Squeaky!! They are just thin egg noodles - I bought them at the grocery store. They were in the dried pasta isle. At my store they are on the bottom shelf with all the other sizes of egg noodles.